In this podcast we will be focusing on Maurizio Cattelan, the “Houdini” of the Art World, always escaping and pulling off stunts, he is a prankster whose works are funny and dark, he is a very difficult man to pin down. Cattelan was born on 21 September 1960 in Padua Italy. He was born into a poor family, his mother was ill a lot and he had little schooling. In his early 20s, he drifted from job to job scraping a living. His first real creative job was making wooden furniture in Forlì, a city in Emilia-Romagna, northern Italy. In 1989 he was given the opportunity of a solo exhibition. But he did not have a good idea as to what to show. So, he simply hung up a little sign on the gallery, which read “Torno Subito” and locked the door. when guests turned up for the viewing, they were just confronted with the sign and no other information. This can not have been good PR for getting people to attend future events! Possibly impatient to get known in the art world. He decided to get himself on the cover of the highly regarded Flash Art magazine. He bought several copies, arranged them in a pyramid, like one you might create with playing cards. He then photographed this sculpture and used the photo to create fake covers, that were glued on to the magazines. He took them back to the shops and placed them back on the racks. Extra bonus info: There are 3 actual magazine sculptures still in circulation one sold for $84,000 in 2013. In 1992 Cattelan decided to start a foundation offering art scholarships, to any artists who would not work for the year, his idea was “Art as a form of laziness”. He named the Foundation after a character in a Russian novel by Ivan Goncharov. Oblomov was a lazy 19th-century character who does nothing but contemplate life. He raised almost 20 million liras, but was not successful in finding anyone who would take up the opportunity not to work for a year. In the end, he found that he was the only person for the job. He used the money to finance a trip to New York. Still trying to find recognition in America, he met and becomes friends a fellow Italian, who was involved in the staging of Venice Biennale. The Venice Biennale is a famous Art Expo in which artists are invited from all over the world to show their work. Cattelan was offered a chance to show his work there. For the 1993 Biennale, Cattelan hired a billboard company to install a large advert in the space, in this case, it was for perfume. This was the only work he showed at the exhibition. He had the owners of Galleria Raucci in Naples, dress up in lion costumes for the entire run of his solo exhibition. One time he taped the rather portly Massimo De Carlo to a wall. It looked like a “duct tape crucifixion”. Massimo actually had to be taken down after a couple of hours because he was suffering from exhaustion and lack of oxygen. These pieces they cut out the middleman, making the gallerist, the subject of the work. They were performed at a time when the gallerist was the powerful figure in art, this challenged the normal relationship between the gallerist and artist. This is a figure of Maurizio Cattelan who is peeping through a hole that has been cut in the floor the gallery space, it looks like it is breaking in to the museum. 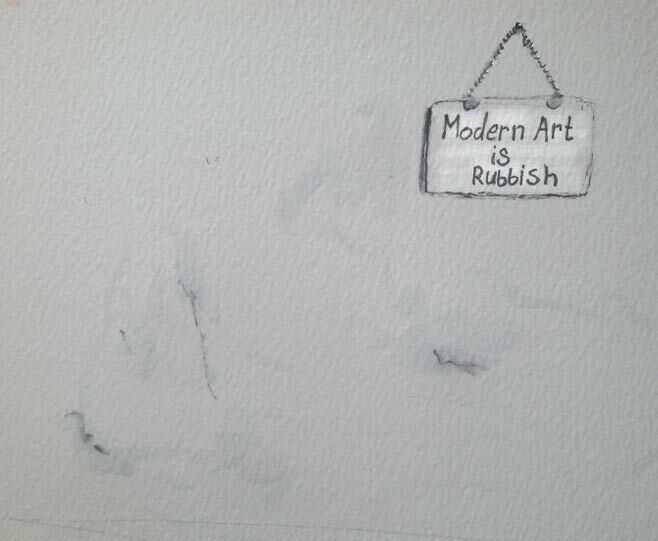 This piece shows the way the artist outsider has broken into the art world. 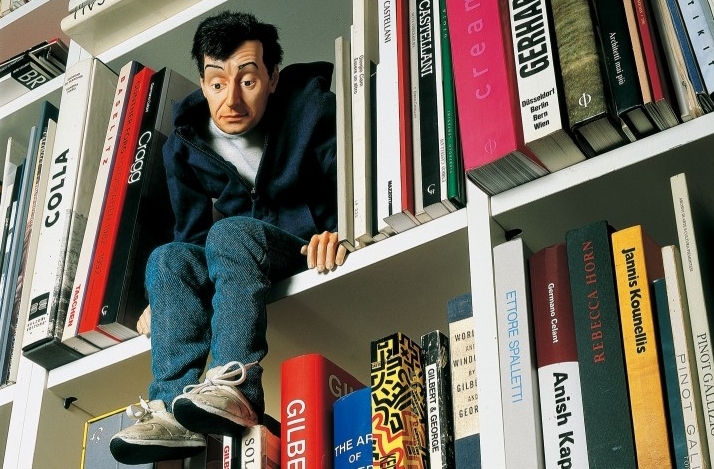 A small resin sculpture of Cattelan that sitting high up on a bookshelf, looking down on the viewer. A 1972 Piece by Joseph Beuys had the same name. It is a sculpture of Cattelan being hung on a clothes-rail he is dressed in a felt suit like the artist used to wear. Cattelan, always disappearing; this piece is just simply sheets tied to together so someone can make their escape out of the window…..
Cattelan has taken this idea of escape so far in fact, that he has hired someone to replace himself, Massimiliano Gioni. Gioni will frequently give interviews and do lectures as Maurizio. The 5 previous Biennale were not successful. Maurizio and Jens Hoffmann ( a Costa Rican gallery curator) were given the opportunity to do the 6th. To promote the event they took out the required magazine ads, press releases, institutional sponsorship, and hired a roster of star artists. The one difference with this art event was that there was no art on show. Attendees just spent the time enjoying the sea, drinking, listening to music and partying. Hoffmann said that they didn’t want to be “polluting our visual world with more installations, paintings and artworks”. Maurizio has created many sculpture works many not without controversy. Jesus was on the cross and in the ninth hour cried out My God, my God, why hast thou forsaken me? » (Matthew 27:46). La Nona Ora is a life-sized effigy of Pope John Paul II struck down by a meteorite. When it was displayed in Warsaw, two Polish Mp’s tried to remove the meteorite and stand the figure upright. They also tried to get the gallery director dismissed. However, some priests had praised the work saying that it was an allegory of the burden that a pope must carry. Untitled is a sculpture of three boys hanging in a tree that was situated in a Milan square. Before working exclusively with stuffed animals, He started out with a live one. This piece consisted of a donkey and a chandelier. The donkey made so much noise the exhibition had to be closed early. This piece is an elephant with a sheet over it, there are holes for its eyes and space for its trunk to go through. It is like an Elephant pretending to be a ghost. A metaphor for the elephant in the room? What was amazing about the 2011/ 2012 exhibition piece “All” was that the Guggenheim suspended nearly all his major works from the ceiling of the museum. This was to coincide with his supposed retirement. President Trump’s White House emailed the Guggenheim in New York City and asked to borrow would a Vincent Van Gogh painting, “Landscape with Snow,”. The curator informed them that it was not available but they can have use of a working 18-karat gold toilet. The working gold toilet is called America and it is open to the public to use. Asked for quote Cattelan just said: “What’s the point of our life? Everything seems absurd until we die and then it makes sense.” Then he hung up. Extra bonus info: Apparently, this March the toilet was “yarn bombed” someone used premade gold crochet to cover the toilet. Here is some extra bonus info we found out, that was not included in the show…. As part of the 2001 Venice Biennale. Cattelan flew out selected guests including rich collectors, critics and curators to Palermo in Italy. He then took them on a coach ride to a local dump for a champagne reception. There he had created a life-size replica of the Hollywood sign. In this piece, Maurizio is trying to make it look as though a wheelchair is moving on water, in reference to a Biblical walking on water. Paralympic athlete Edith Wolf-Hunkeler (Swiss former wheelchair racer) is the person in the wheelchair. It didn’t go as well as expected at one point an assistant had to dive in to help. You can find most images (that are not listed below) and extra info on the website of the gallery Perrotin who represents Maurizio, it is a really interesting resource.